These are made of an Acacia or Rubber Tree Wood, hand carved and painted in Indonesia. They stand 16 inches high. And about 6 inches wide. They can stand up or lay down. They can be paired up to stand up against each other. The enhancing element is Fire; anything that is “alive” represents Fire. So in addition to adding red colors or actual fire elements such as candles, lighting or sun faces; you can add figurines or pictures of animals to this Gua. 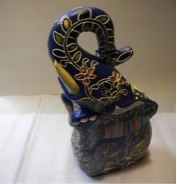 These gorgeous Batik hand painted elephants are lovely and well…I adore elephants. Their pose is adorable they can be stood up or laid down. The muted color could also be placed in the Centre Gua and the Blue one could go in the Knowledge and Self Cultivation Gua. If paired up could be placed in the Love Gua and could be placed in the Children and Creativity Gua because of the hand carved and painted aspect of these gorgeous pachyderms. Elephants represent Power and Prosperity and while there is dispute about which way a lucky elephant holds its trunk, there is a general belief in many eastern cultures that an elephant with the trunk pointed up "stores" luck and one with the trunk down "dispenses" it.